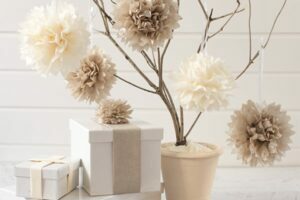 My boyfriend’s daughter made these easy DIY paper tissue flowers (aka tissue paper pom-poms) in school and she showed me how to do them using a napkin one day while we were waiting for our lunch. They are such a beautiful idea and easy for anyone to do! What a great Christmas or winter wonderland decoration! The other night I find the step by step directions for them and beautiful pictures I have to share with you. Tara Dennis did a wonderful job and I hope you enjoy this Christmas decoration idea..
Keep the layers together and fold like an accordion, creating an inch (or so) thick stack. Wrap a small piece of wire (or tape or string) around the center of the folded paper. Slip a piece of ribbon or string under the wire. If using tape, place the string first and then tape over it. This is to hang it. 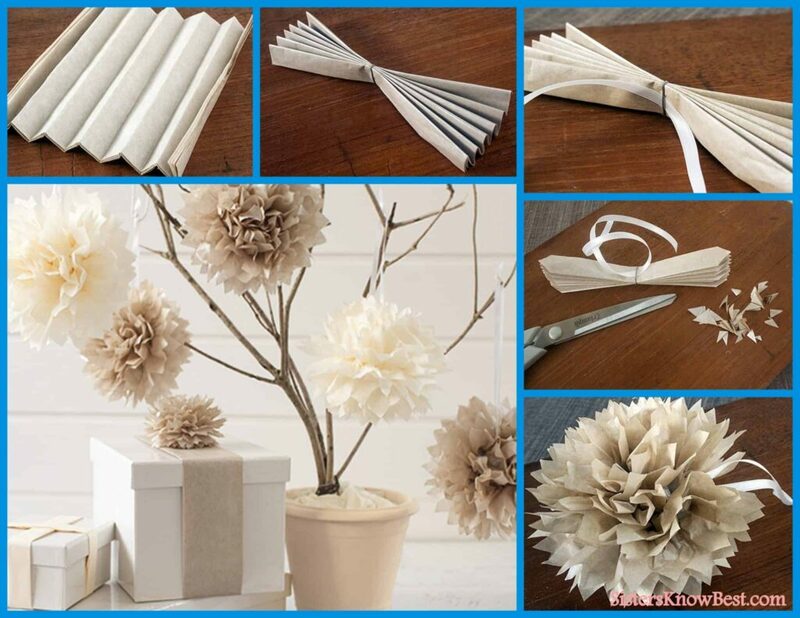 Trim all the ends of tissue paper to create points for the petals. Hold the paper in middle and separate each layer one at a time pulling towards you. Be gentle so as not to tear the tissue paper. Shake to add separate the layers more and give a fuller look to the flower. Flowers make any room brighter. In the fall we had Nicole Duke’s Leaf Roses. In the winter we have these beautiful Tissue Paper Flowers. Show us your results by posting picture on our Facebook page! I’m certainly looking forward to seeing this outcome. We’d love to see yours! Post them on our Facebook page! Good luck Linda.